Streetfood has remained a permanently exciting and indulgent fixture in my daily comings and goings around Saigon. I have expressed a few thoughts on this blog in the past about pho, the staple Vietnamese noodles (increasingly popular and available in the UK now, I noticed last month) and which we usually eat two or three times a week. There are some moments when noodles just hit the mark. Fiery chili heat combined with leaves, bamboo shoots, raw steak and delicate broth. There are some moments – for me, this is currently every day, hence capturing this for future posterity – when only Com Tam will do. 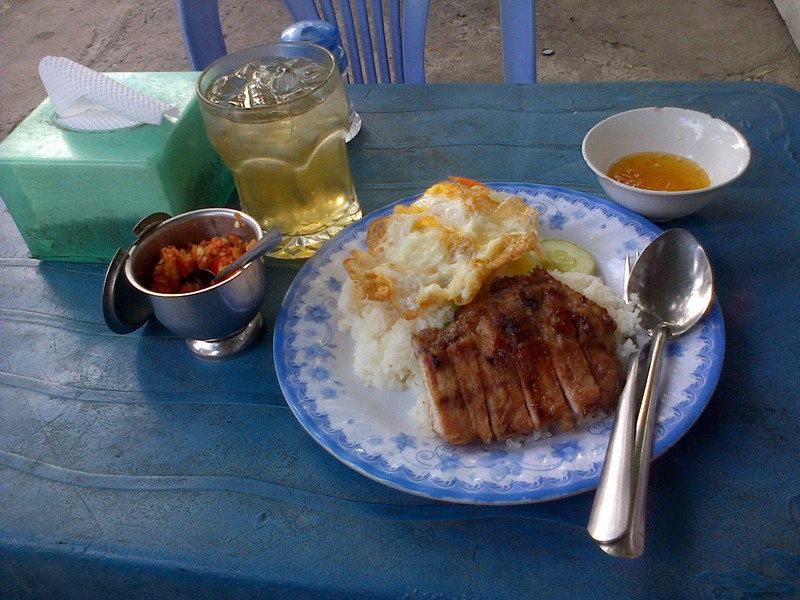 Com Tam translates as “broken rice” and is a special type of rice, shorter, slightly more al denté than normal rice, and typically accompanied with chopped cucumber, chives, bbq pork (or other types of meat) sweet honey sauce, chili and, should you desire, a fried egg on top. In a short while, we will be subjected to 2012 “lists”. Top Ten Celebrity Gossip of the Year. Most Popular Boy’s Name. Worst Dressed Politician. All of the above, and more. Inspired by a meeting with an elderly Vietnamese monk last month, here, in the spirit of such things (ie for fun, rather than for anything more meaningful) are my “Top Things Learnt about the Vietnamese in 2012”. 1. Face protection – “one life, one face” is up there as a life motto for most Vietnamese. No matter what the scenario, saving face in all situations is paramount. Late to the party, as usual, I’ve been enjoying the work of Yang Liu – a Chinese-German artist http://www.yangliudesign.com/ whose interpretations of the differences between these two cultures is captured in her East vs West series. Sunday afternoon, and I have a hangover. A fitting state perhaps to welcome in the start of the festive season, although the combination of last night’s beers, 5 hours sleep, Martha wailing like a banshee, and Florence enthusiastically using me as her personal drum-kit, was not quite the ideal scenario first thing this morning in terms of remedying a sore head. I used to love December back in the UK. It can be the most indulgent month of the year, and also the most random in terms of habits.